I find myself doing far less talking on the phone these days. That is part of the reason I’ve pretty much dropped my use of landlines. At home and work I only use my cell phones or, at times, I use Line2 or Skype on my tablet or computer. I honestly cannot remember the last time I picked up my desk phone in the office. People pretty much all know to reach me on my cellphone. Period. And while my iPad serves as a decent speakerphone and my MacBook Pro with retina display has dual array microphones, they aren’t terrific for calls. Functional yes but they do not make the best, clearest calls possible. In addition, neither is great for conference calls since the microphones are designed to capture audio from the individual sitting directly in front of them. That’s where the Jabra Speak 510 UC speakerphone comes in. 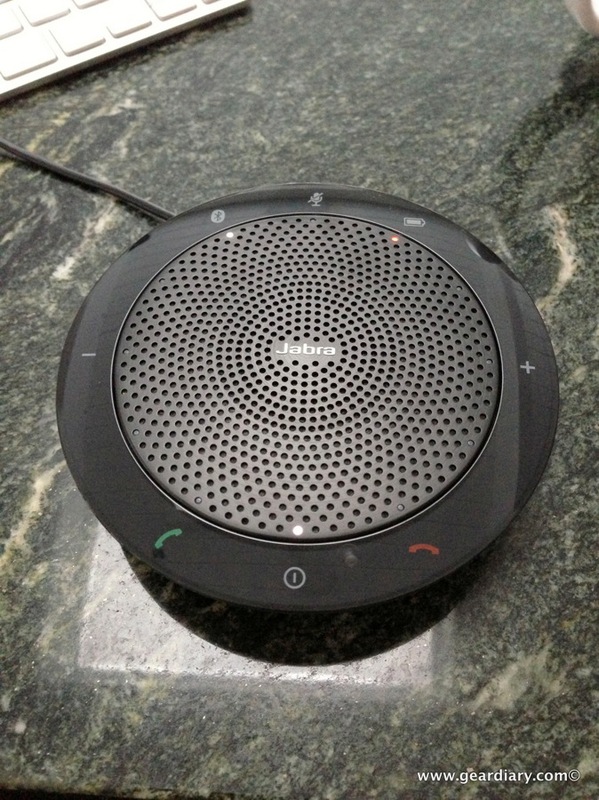 The SPEAK 510 line- there are three variants “takes audio conferencing to a new level”. After using it for a little over a week at both home and the office, not to mention on the go, I have to agree. The Jabra SPEAK 510 UC stands out in its ability to work with both a computer and a mobile device and switch between the two with ease. For mobile devices it connects wirelessly. For desktop VOiP conversations it connects via the built-in USB cable. Let’s take a closer look at the unit itself and then discuss the experience of using it. The speakerphone is basically a round black disc of plastic with a grill on the top, some button indicators around the perimeter, and a USB cable that wraps around the base and tucks out of way. It is compact and unobtrusive when sitting on a desk. The capacitive buttons are responsive and, because there are no moving parts, the unit feels quite solid. What you cannot see when the Jabra SPEAK 510 UC is off are the various indicator lights running around the unit at the edge of the speaker grill. The inclusion of a protective case rounds out an otherwise simple speaker that can be thrown in a bag and taken anywhere for use whenever it is needed. Add in the fact that turning it on and setting it up is a breeze and this is a great addition to a mobile-worker’s go-bag. Outward appearance would suggest this is only USB speaker. It is not. The speaker has a built-in battery that is charged whenever the USB cable is plugged in. Bluetooth 3.0 is also baked into the speaker which means you can leave the USB cable tucked away at the bottom of the speaker itself. The best way to understand the Bluetooth functionality of the Jabra SPEAK 510 UC is to think of it as a huge Bluetooth headset that could only fit in the ear of a giant. That really encompasses the use and functionality it offers. Put another way, if you can use a Bluetooth headset, then you can use the Jabra SPEAK 510 UC. To use it you simply press and hold the spot that indicates the power button and wait for the ring of lights to come on. You then press and hold the spot with the Bluetooth indicator and wait for the voice to tell you the speaker is in pairing mode. After that you simply pair the Jabra SPEAK 510 UC as you would any Bluetooth speaker. 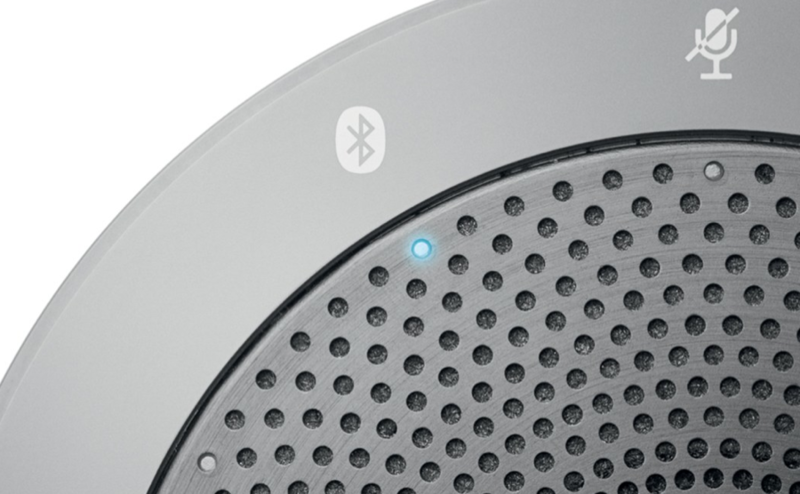 And while this speaker is designed for serious work such as conference calls, it also had the ability to stream music from your Bluetooth-connected device. 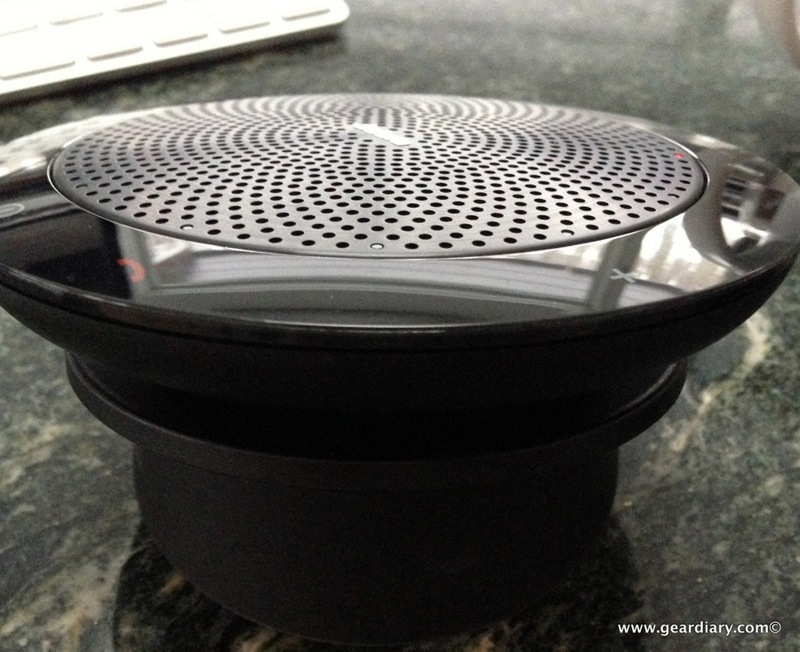 I was blown away by the 15 hours of talk time the Jabra SPEAK 510 UC offers. That is incredible and means you will have the ability to hold a conference call pretty much whenever and wherever you need to. Best of all, it actually sounds quite good. Bluetooth is great but, when using a speaker with a computer, having a wired connection can make setup and use simpler. It can enhance the quality of the audio. That’s where the USB connection on the Jabra SPEAK 510 UC comes in handy. You simply unwrap the USB cable, plug it into the computer and select the speaker as the audio device. The speaker is plug and play which means there are no drivers or additional software that needs to be loaded before you get down to business. 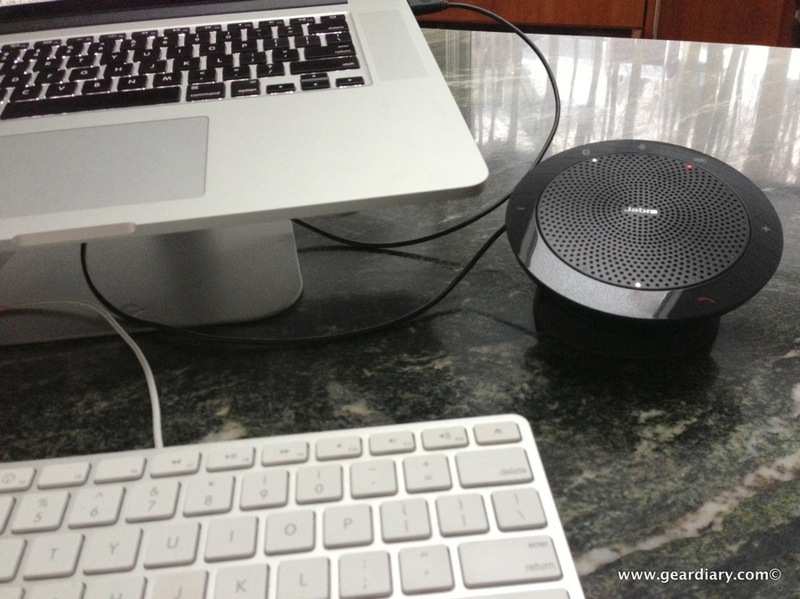 Jabra offers Jabra PC Suite audio software for both the Mac and PC that can help manage calls and control the audio device. 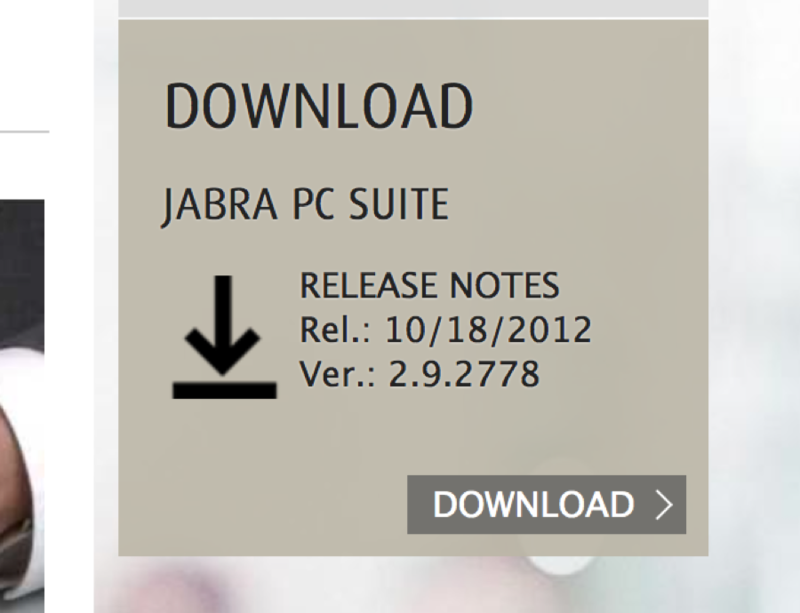 It is a free download from their website although I did have to hunt for the Mac version of it. I loaded it and it set about integrating with Skype. It is worth noting that before I could get everything to work I had to update the version of Skype for Mac. It is a free download but meant I had to stop what I was doing and deal with Skype first. From there is was simply a process of letting the computer know I wanted to use the Jabra SPEAK 510 UC as my audio device. Studies indicate that, by 2015, the “mobile worker population” in the United States will account for some 75% of the workforce. I, and likely you, are already part of the statistic since we no longer work from 9 to 5. No, we have the ability to work anywhere, anytime and… we do. Email and other messaging system have cut into the number of calls I make but I still need a good quality phone connection numerous times each day. You are likely the same. And while I am able to get by with the microphones and speakers built into my laptop, tablet and phone, the quality leaves something to desire. The Jabra SPEAK 510 UC steps in and fill the audio gap left by these mobile devices and it does so beautifully. And because Jabra understands that a call may begin as a speaker-phone conversation but need to switch over to a private call either for security or because you need to be on the move, they made transferring calls from the Jabra SPEAK 510 UC to a headset simple too. They really seem to have thought of everything you might need in a speakerphone and then executed it in an impressive manner. Truth is, I can’t find anything to criticize about the Jabra SPEAK 510 UC at this point. It does what it promises and it does it well. 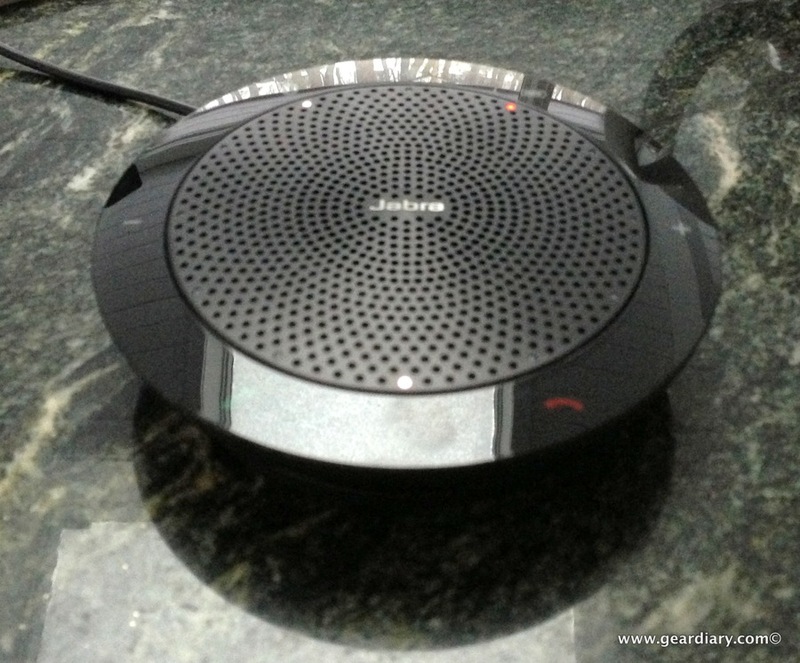 If you need a good speakerphone that can work with ALL your devices you’ll want to check it out. 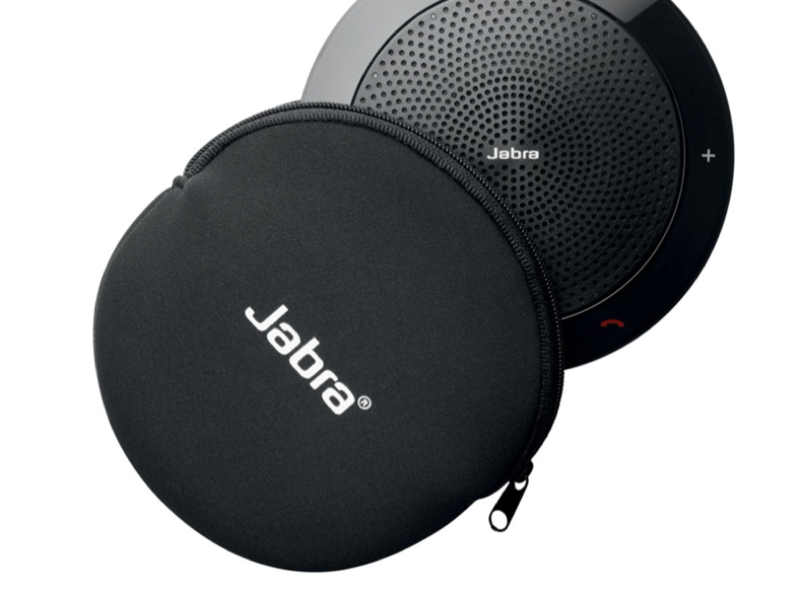 You can check it out here on the Jabra website and you can order it here through our Amazon Store.